While the original VLTOR M14/M1A Stock System has been the essential upgrade to the Springfield SOCOM platform, VLTOR saw huge areas of improvement. The stock system is now formed with VLTOR’s proprietary mold and is manufactured with a proprietary carbon fiber composite. This makes the stock system stronger and lighter than ever before. The stock is adjustable for five lengths of pull and adjusts for elevation. In its lowest position the stock will allow for the use of iron sights or the stock can be raised up to 1.25″ higher for use with mounted optics. 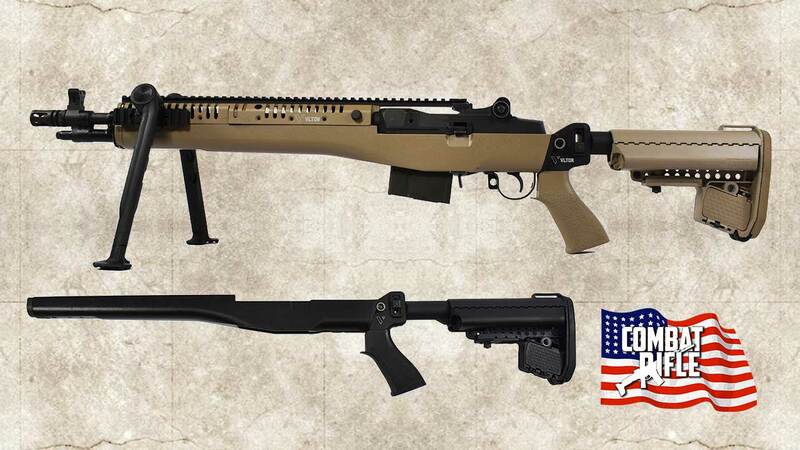 This stock system features an improved magwell relief that allows for easier operation of any M14/M1A magazine. The buttstock is slightly wider and longer at the toe than a regular M4 stock with a noticeable negative pitch, making transitions from the ready position feel more natural. This is the Delta 14 Chassis constructed of glass filled nylon. Mounting of the stock is simple with the 5/16X18 fastener that will mate in any Mossberg 500 stock onto the chassis system. Installation of the chassis with the rifle does not require any tools. Simply pull the trigger guard from old rifle and remove the barrel and action. Drop into the Delta 14 Chassis and reinstall the trigger group. One Chassis and a multitude of options. Whether you are looking for a pistol grip or Monte Carlo, you can interchange at will with the same platform. Installing the rifle is the same as the factory stock and does not require tools. One Chassis and a multitude of options. Components are individually packaged, assembly required. Using an Allen wrench, fasten the bolt into the back of the chassis receiver 5/16X18 UNC hole provided in the chassis. Note this is a steel t-nut molded in the stock so be cautious not to cross thread the bolt. Damage to the threads might disable chassis performance. Minor fitting of the stock to the chassis might be necessary due to differences in stock manufacturing practices. Lighter than machined aluminum stock/chassis systems. No impediment to the action. 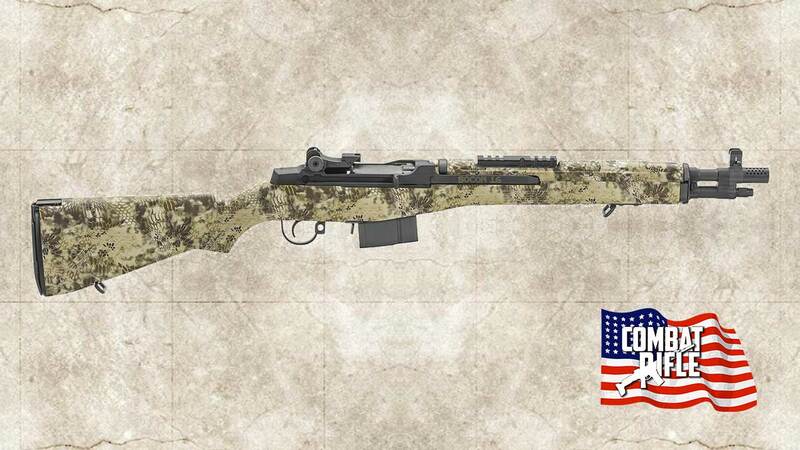 The world of tactical rifles forever changed in 2004 when Springfield Armory® introduced the M1A™ SOCOM 16. 7.62NATO power in a package this small was previously unthinkable. Shooters who need a compact rifle no longer have to settle for a lesser caliber, although they can expect less felt recoil and less muzzle rise, thanks to the SOCOM 16′s unique design. 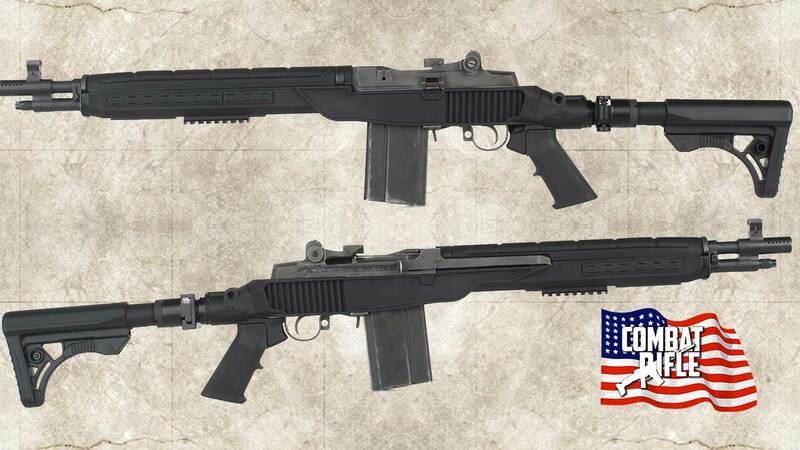 Complete short-action receiver and bolt assembly give the reliability and smoothness of the classic Remington 700 action combined with innovative features designed specifically for police, military, and civilian precision shooters. Receiver is machined, not forged, to exceptionally tight tolerances from a solid billet of 4140 chrome molybdenum steel for precise dimensions and superb strength. Raceways are EDM-cut to be perfectly square with the receiver face, threads, and bolt locking lug surfaces. A rail in the left raceway eliminates misfeeds caused by a shell getting stuck in the raceway, and the extended ejection port ensures plenty of clearance for fired cases. Full-length, 20 M.O.A. MIL-STD 1913 Picatinny rail milled into the receiver top offers exceptional scope mounting flexibility and stays perfectly aligned with the action centerline and barrel tenon threads because it can’t work loose or get misaligned by impact. Hefty ¼” thick recoil lug machined into the underside spreads recoil force over a larger area than standard lugs. Bolt is machined from a single piece of 4140 steel billet, including .308 (.473″ diameter) breech face, extraction cam, and bolt handle; outside diameter and locking lugs are machined in a single operation, so the lugs are perfectly square with the bolt exterior. Bolt maintains a .007″ clearance out of battery, with .004″ clearance (.002″ per side) when closed. Streamlined, screw-on tactical bolt knob can be replaced with other aftermarket knobs to suit your needs. Shroud around the oversize bolt stop keeps out dust and dirt and prevents accidental release. All components are heat treated for hardness before final surface machining to prevent unwanted stress or warpage. Extractor, ejector, firing pin, shroud, and cocking piece are standard Remington 700 parts, and action accepts all triggers, stocks, and magazines compatible with the 700, greatly expanding customizing options. All 591 actions are designed with an integral .250″ recoil lug and 20 MOA 1913 MIL-STD picatinny rail that runs the full length of the action. A side-mounted, shrouded, bolt-stop is integrated to help prevent accidental releasing of the bolt. In the middle of the left bolt raceway is an anti-jam rail. This rail is designed to prevent a round from lodging in the raceway when single-loading the rifle through the ejection/loading port. The raceway on the right-hand side has an anti-bind rail just below the ejection/loading port. The purpose of this rail is to insure smooth bolt operation as the locking lug passes through the loading port. The 591SA will work in conjunction with any stocks made for the Remington 700 short-action with little to no modification. It will also work with these triggers and feeding systems. *All Surgeon Rifles™ actions are shipped uncoated and include a tactical Surgeon Rifles™ bolt knob (0-ring bolt knob shown available at additional cost). SPECS: 4140 chrome molybdenum steel, in-the-white. Includes receiver, bolt, bolt knob, bolt stop, bolt stop pin, bolt stop spring, ejector, ejector spring, ejector pin, extractor, firing pin, and trigger pins. The Remington 700 Barrel -These days Remington does a fine job manufacturing accurate rifles. However there may come a time when the old Remington 700 is not shooting groups as tight as it once did or maybe you just want the best accuracy that can be achieved from your rifle. A replacement barrel is a good investment. Its like getting a new and more accurate gun at half the price. All barrels for a Remington model 700 will be required to be fitted to some degree by a gunsmith. If you choose a barrel such as the Shilen it requires the least amount of work as it is pre threaded with a cut chamber. This means it only needs reamed to the final dimension. Other barrels are purchased as blanks and must be cut to length, threaded and have the chambers cut and reamed for your desired caliber. In many cases the barrel will require some sort of coloring or protective coating as many barrels are sold “in the white”. Note: There are no drop in barrels for a Remington 700. All replacement barrels must be fitted and headspaced by a qualified gunsmith Note: Replace your factory Remington 700 Trigger before you consider a new barrel. Visit the Remington 700 Trigger page for further information. Christensen Arms offers a REMINGTON 700 CARBON WRAPPED BARREL. It’s their only entry in the crowded Remington 700 Barrel field. Designed using precision engineering adopted from the aerospace industry, Christensen Arms carbon-fiber barrels are crafted using a proprietary layered design that offers any marksman superior accuracy and performance. The barrel lining is made from match-grade 416R stainless steel and is measured to a tolerance of +/- .0001. When it comes to accuracy, Christensen Arms carbon-fiber barrels have performance you can trust. The Original Carbon Fiber Remington 700 barrel is available for your favorite rifle. Simply select the barrel version for your application. Following your online order, a CA representative will contact you for all necessary specs and/or arrange for shipping logistics to send your rifle to our facility. Criterion Barrels produces 308 AR barrels for OEMs like American Defense and the Fulton Armory Titan series of tack driver rifles. We are big supporters of Criterion Barrels. Range time, competition wins and online reviews speak volumes. Shilen Barrels are among a small group of elite barrel manufacturers that can be considered the best of the best. Shilen Select Match Grade Remington 700 Barrel – These stainless steel masterpieces of machining and hand lapping are intended for the competition shooter– or even the hunter– who wants the ultimate in accuracy and quality. These are our highest grade barrel and, of course, the most costly. What makes them so good that benchrest shooters, such as Tony Boyer, crave them? Consider this: To meet Select Match Grade criteria, the groove diameter must air gauge within .0003″ of our standard diameter. Moreover, the uniformity of the bore cannot vary more than .0001″ for the entire length of the barrel. These barrels are also completely stress relieved, and the bore is polished to a gleaming surface finish by our most experienced lappers. Our Match Grade barrels don’t quite meet Select Match criteria– but not by much! In these barrels, the bore must measure within .0005″ of our standard diameter and cannot vary in diameter more than .0003″ for the length of the barrel. So how much accuracy does a couple of “tenths” give away, compared to our Select Match barrels? Perhaps not any! The point is, whether or not there is any real difference in the accuracy potential between the Match and Select Match grades, the really demanding shooter must play it safe and go with the higher grade. In many cartridges and barrel twists, the accuracy difference between the two simply can’t be detected. So unless you’re gunning for one-hole groups or just demand the top of the line, the Match Grade barrel is your best choice for many forms of competitive shooting and for hunting varmints and big game. The Match Grade is completely stress relieved and fully warranted. The price of Match Grade stainless steel barrels includes hand lapping to a beautifully smooth surface. Chrome-moly can be lapped to a similar finish at an additional charge. Both are available in all calibers, twists and contours. These barrels are made to the same contours as factory Remington 700 barrels. Lilja barrels have also been used by all the major bullet manufacturing companies, and by the ammunition industry for accuracy and pressure testing of their products. Lilja barrels are made from rifle barrel quality, 416-type stainless and 4140-type chrome-moly steels manufactured in the U.S. In addition, all of our tooling is either made in our shop or by U.S. suppliers. The barrels are pull-button rifled, with a very uniform twist rate. Every barrel is stress-relieved in a vacuum furnace, hand lapped, and inspected with a video bore scope. Quality is also assured through the use of our Sheffield Air Gauge System and Rockwell Hardness Tester. Stainless steel barrels are guaranteed to be uniform dimensionally to .0001″ and free from internal tool marks. Chrome-moly barrels are uniform to within .0002″ end to end. We do not have different grades of barrels in the two types of steel: just one, our best match quality. “Standard Match Remington 700 Barrel”: Our Standard-Match barrels are supplied in both stainless and chrome-moly steel. These barrels are made using conventional rifling button designs and are available in many twist rates and land/groove configurations. Standard-Match barrels are carefully hand-lapped for excellent bore uniformity and surface finish. These barrels are capable of excellent accuracy potential and are recommended for most hunting and varmint shooting applications. Standard-Match barrels are available as blanks, contoured barrels, and prefit contoured barrels. “Super-Match Remington 700 Barrel”: The PAC-NOR Super-Match barrel is our premium grade rifle barrel. These barrels can be supplied in stainless or chrome-moly steel. Super-Match barrels are made using a proprietary rifling button design which yields barrels that have an extremely uniform rate of twist for the ultimate in accuracy potential. Super-Match barrels are designed with a unique land/groove geometry which ensures a good bullet gas seal with minimal bullet distortion. This special land/groove configuration also substantially reduces metal fouling in the barrel when the barrel is properly broken-in. All Super-Match barrels are carefully hand-lapped to a fine lustre finish and exhibit the exceptional dimensional uniformity required for the high level of accuracy possible using this product. Super-Match high performance barrels are recommended whenever the ultimate in accuracy is required. These barrels are supplied as blanks, contoured blanks, and prefit contoured barrels. Krieger Barrels has been making premium rifle barrels for over 30 years. All of our barrels are manufactured using single-point cut-rifling and each and every barrel we make is thoroughly inspected and held to the same premium match grade standards, whether its an ammunition test barrel, a custom bolt action barrel or a ready-to-install finish chambered AR15 Bolt Action: From 20 caliber to 4 bore: Krieger Barrels makes fully custom bolt gun blanks. Whether you are looking for a replacement barrel or putting together a custom rifle, Krieger Barrels will make the barrel you need. 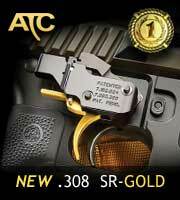 Choose from our catalog or specify your contour, caliber and twist rate. In some cases you can even specify the number of grooves, groove width and custom bore and groove dimensions. Fluting, muzzle threads, fitting and many other services are available. All of our barrels are single-point cut-rifled and thoroughly inspected to produce satisfaction guaranteed match-grade rifle barrels every time. Order online or give us a call at (262) 628 – 8558 to place your order today! Broughton Rifle Barrels / North Manufacturing Co., Inc. is dedicated to crafting one of the Premier Stainless Steel Rifle Barrels in the U.S.A utilizing the 5C ® process. For any serious shooter, be it a Hunter or Target Shooter, having a rifle built with quality components is a must. If you want to build a rifle with a premier target quality barrel that will give the shooter the edge they need to shoot that trophy mount or shoot a small group, then you want a Broughton 5C® Rifle Barrel. Broughton 5C® Rifle Barrels are crafted from the finest material made today, 416R Stainless Steel. They are pulled button-rifled, Double stressed relieved at the mill & triple stress relieved in our shop at Broughton 5C® Rifle Barrels. Then each barrel is hand lapped with a uniform land and groove diameter up to 0.0001″ from breech to muzzle. Our muzzle is NEVER larger than our breech. We offer a variety of land and groove combinations for most twist in calibers 22RF to .375 with 5C ® rifling, but conventional rifling is available. We are continually adding new selections to meet the demands of new bullets and cartridges. Please give us a call at (920) 922-4882 for specific combinations. Since 2003 we have introduced 22RF, .224, .243, .264, 270, .284, .308, .338, and .375 caliber “5C ®” (canted land) barrels. These barrels are showing exceptional clean ability, more velocity, longer barrel life, reduced bolt / breech pressure and extreme accuracy – shooting small groups at short and long ranges. We will expand this 5C ® land formation into other calibers and twist options in the future or when used to meet your needs. Each barrel is crafted with the highest of quality standards. If a barrel doesn’t meet our quality standards, it does not go out the door. From start to finish we track what is being done and the results to each barrel by serial number. An individual tracking record is kept with your file for every barrel. If a customer has a question or concern about their specific barrel or would like a barrel similar as another customer, we can look it up and duplicate or continually improve the process. Our craftsman takes pride in every barrel we ship. It is our commitment to you to craft the finest rifle barrel your money can buy. Give us a call at (920) 922-4882 to discuss your next barrel purchase. Quality, Accuracy & Customer Satisfaction is #1. We guarantee it! You’ll find E. R. Shaw gun barrels all over the world – utilized by some of the biggest firearms manufacturers as well as individuals who want only the best. E. R. Shaw engineers only Premier Grade barrels made by skilled craftsmen with years of barrel-making experience and utilizing the latest technology and metals. When you need a gun barrel, precision engineered to very exacting specifications, you need E. R. Shaw. Our years of research and hands on experience combine to provide you with a fine finished product. Fluted Remington 700 Barrels At E. R. Shaw Custom Barrels we offer three types of rifle barrel fluting for you to choose from – Traditional Straight Fluting, Shaw’s Patented Helical Fluting (U.S. Patent DES. 426,611) or Shaw’s Patented Functional Helical Fluting (U.S. Patent USG. 324,780B1). The unique appearance of our Helical Fluting (U.S. Patent DES. 426,611) provides the discriminating shooter with a barrel that looks great. Shaw’s Patented Functional Helical Fluting (U.S. Patent USG. 324,780B1) is thirty percent more rigid than a similar barrel with Straight Fluting; provides improved barrel harmonics; helps to counteract rotational torque, giving the shooter greater shot consistency; and increases the barrel surface area. Finishes and Bluing Services – Our premium-grade bluing is second to none. We use an exclusive blue-black process which results in a rich, deep luster. For those wishing that added custom touch, we offer a bead-blast matte finish which is glare-free and lends an understated elegance to any rifle, especially those stocked in the classic style. 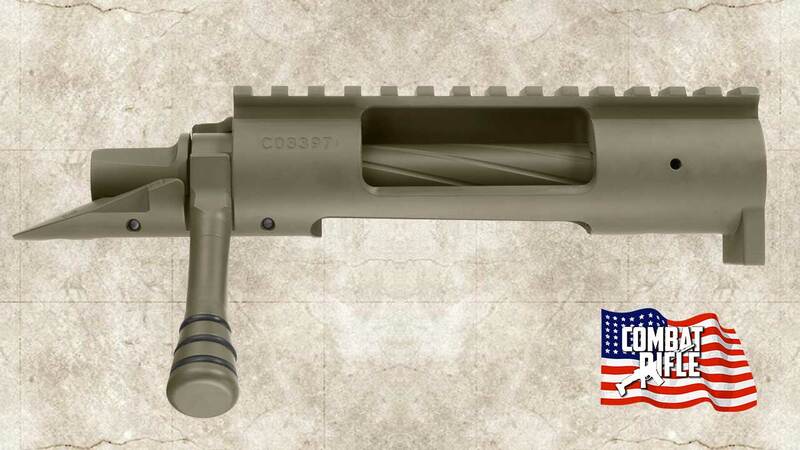 Our bead-blast matte finish is also available on our 416 Stainless Steel barrel. Please note that our action bluing services are available only on rifle barreled actions that we have installed on one of our barrels. Formed in 2007, McGowen Precision Barrels builds on a proud tradition of custom barrel manufacturing. McGowen Precision Barrels was started with the purchase of Harry McGowen’s “mothballed” machinery. The manufacturing process has been updated to 21st Century techniques. Using state of the art equipment, and finely honed manufacturing techniques, McGowen Precision Barrels aims to make the highest quality barrels on the market. The manufacturing process continues to undergo changes and improvements in the pursuit of perfection. The McGowen Precision Barrels name is making an impact in the industry, not only in hunting rifles, but are now becoming a favorite of long range competition shooters. We are in the process of perfecting the age old tradition of cut rifling. We are still a few months out from producing barrels for sale. We are working on cut barrels with the highest degree of accuracy manufactured with 21st Century digital perfection. McGowen Precision Barrels will continue to upgrade our machinery and our capabilities. One upgrade in our capabilities is the addition of cut rifled barrels. As of February 27th, 2014 we are still working on the cut-rifling machine. We do not have an anticipated date in which these will be available. Please note that calibers will be limited at first as we bring the machines online. We’re also working hand-in-hand with our sister company McGowen Gun Works to manufacture custom rifle actions. We are currently working on the final design on our patented Mini action. We’re working hard to have this available before the end of 2013. Keep watching here and our sister companies website americangunco.com for more information.